Unicorns are real and a real pain in the neck. Especially when they try and trample down this humble Torero! Arm him with magical red capes and spikes as he takes on and takes down charging unicorn after unicorn. Collect their rainbow credits to buy power ups and use your fancy footwork to dance your way out of a tough situation. Rev up and take off and over ramps, jumps, through hoops of fire and on top of semi tricks. Show off up to 5 different moves to build up your point total and dominate the circuit. Keep the black square inside the blue box for as long as possible. 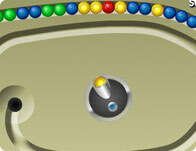 Simply move your mouse and try to gain the highest score.